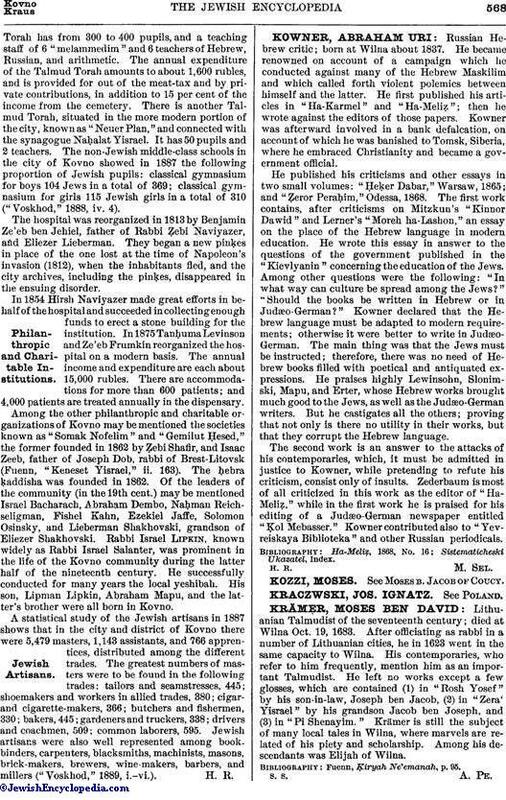 Russian Hebrew critic; born at Wilna about 1837. He became renowned on account of a campaign which he conducted against many of the Hebrew Maskilim and which called forth violent polemics between himself and the latter. He first published his articles in "Ha-Karmel" and "Ha-Meliẓ"; then he wrote against the editors of those papers. Kowner was afterward involved in a bank defalcation, on account of which he was banished to Tomsk, Siberia, where he embraced Christianity and became a government official. He published his criticisms and other essays in two small volumes: "Ḥeḳer Dabar," Warsaw, 1865; and "Ẓeror Peraḥim," Odessa, 1868. The first work contains, after criticisms on Mitzkun's "Kinnor Dawid" and Lerner's "Moreh ha-Lashon," an essay on the place of the Hebrew language in modern education. He wrote this essay in answer to the questions of the government published in the "Kievlyanin" concerning the education of the Jews. Among other questions were the following: "In what way can culture be spread among the Jews?" "Should the books be written in Hebrew or in Judæo-German?" Kowner declared that the Hebrew language must be adapted to modern requirements; otherwise it were better to write in Judæo-German. The main thing was that the Jews must be instructed; therefore, there was no need of Hebrew books filled with poetical and antiquated expressions. He praises highly Lewinsohn, Slonimski, Mapu, and Erter, whose Hebrew works brought much good to the Jews, as well as the Judæo-German writers. But he castigates all the others; proving that not only is there no utility in their works, but that they corrupt the Hebrew language. The second work is an answer to the attacks of his contemporaries, which, it must be admitted in justice to Kowner, while pretending to refute his criticism, consist only of insults. Zederbaum is most of all criticized in this work as the editor of "Ha-Meliẓ," while in the first work he is praised for his editing of a Judæo-German newspaper entitled "Ḳol Mebasser." Kowner contributed also to "Yevreiskaya Biblioteka" and other Russian periodicals.